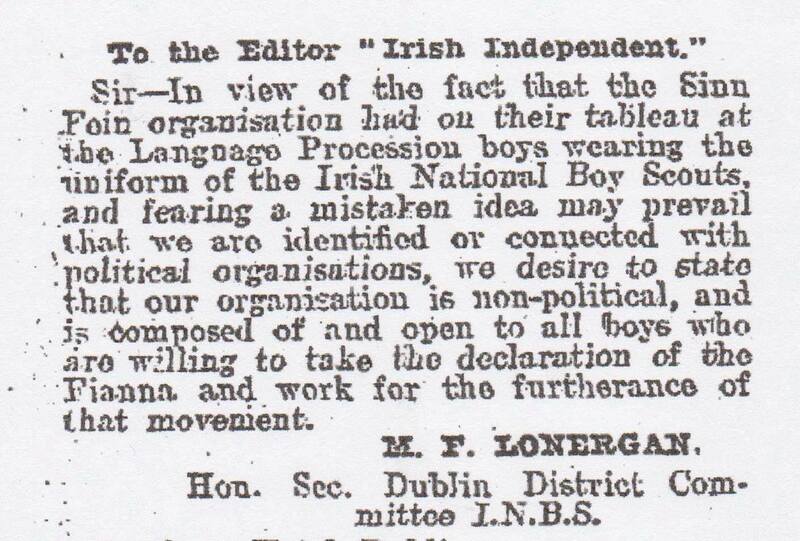 An interesting letter sent from the Dublin Fianna headquarters, to the Irish Independent in 1911.Secretary Michael Lonergan attempts to disassociate and distance the Boy Scout organization from Arthur Griffith’s Sinn Fein party. The Sinn Fein organisation was vastly different in 1911 to the one that emerged as a political force in 1917. In fact by 1911 Sinn Fein was in decline as a political party, despite only being a few years in existence. Arthur Griffith, at that stage, had radical views on the direction the party should take (such as a dual monarchy solution and an alliance with the Unionists), and this did not sit easy with many of the more advanced nationalists of the organization, including Hobson, McCullough, O’Hegarty and Markievicz. Many others also complained of the challenge and struggle of working alongside such a difficult and stubborn man. As a result of Griffith’s stance Fianna organizer and founder Bulmer Hobson fell out with Arthur Griffith in 1910 and had left the Sinn Fein party at the end of the year. Hobson cited ‘political and temperamental differences’ with Griffith as the cause of his departure. Hobson’s departure from Sinn Fein, and Sinn Fein’s policies at the time, can probably explain the Fianna’s reluctance to become associated with Griffith. Hobson was, in 1911, a major influence in Fianna Eireann and was its vice-president. It is likely that the letter emanated from Hobson’s himself but was ‘sent’ in by Lonergan to avoid any controversy. Alongside the Fianna, Hobson was also heavily involved with the IRB at this time. Michael Lonergan, who signed the letter, was one of the most senior and prominent Fianna officers in the early days. He was a founding member, was one of those who designed the Fianna uniform and was also elected to the Irish Volunteers provisional committee upon its formation in 1913. This entry was posted on Monday, January 5th, 2015 at 9:42 am	and posted in Fianna articles archives. You can follow any responses to this entry through the RSS 2.0 feed.